In the United States, today is Veterans Day, so we are honoring anyone who has served in the U.S. Armed Forces. This year, it also marks the 100th Anniversary of the end of World War I.
I decided to take a look at what other lesser known holidays might fall on November 11th, and discovered that today is Origami Day! Not to take away from any tributes to our veterans, I'm just feeling the need to share something a little lighthearted. Origami is an ancient and intricate art made by folding paper. Many credit the Japanese as creating the art form, but its origin is actually very uncertain. Though many of the earliest records (not to mention its name) are from Japan, so it's more likely than not that that's where it originated. The medium was further popularized by Akira Yoshizawa, who also established the formatting for instruction diagrams that we still use to teach origami today. 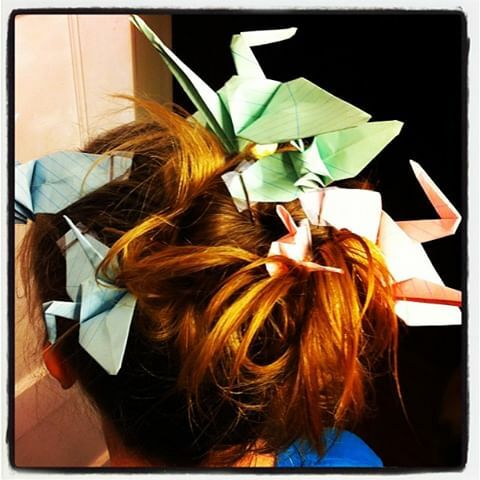 I’ve always loved origami. I learned how to fold a crane when I was little, and still fold them today, especially from small foil candy wrappers. It's the only design I can fold without looking at instructions, and I still find it not only fun, but oddly calming. Here are the instructions for the one I learned to make.